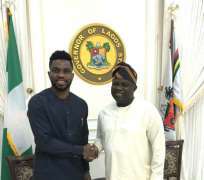 Former Captain of Nigeria's Super Eagles, Joseph Yobo has received the backing of Lagos state governor, Mr. Akinwumi Ambode for his soon to be unveiled project - The Joseph Yobo Sports Academy. The former captain was guest to the Governor at on Wednesday where they discussed youths and sports development in Lagos state and in Nigeria. Governor Ambode welcomed the academy of the former Eagles defender and endorsed the project, describing it as a meaningful venture that the state is proud to be associated with. Joseph Yobo in a statement released after the meeting said: "Governor Ambode has shown commitment to empowering the citizens of Lagos and recognises the role of sports just beyond its significant ability to boost the economy but the ability to harness the potential and overall development of the youths. My academy model is based on the belief that sports excellence and academic pursuit are not mutually exclusive. I welcome his support for my project and the people of Lagos and Nigerians who would be beneficiaries of it." Yobo revealed that the academy would be situated in Lagos and will take off this year but would be fully operational in 2019.